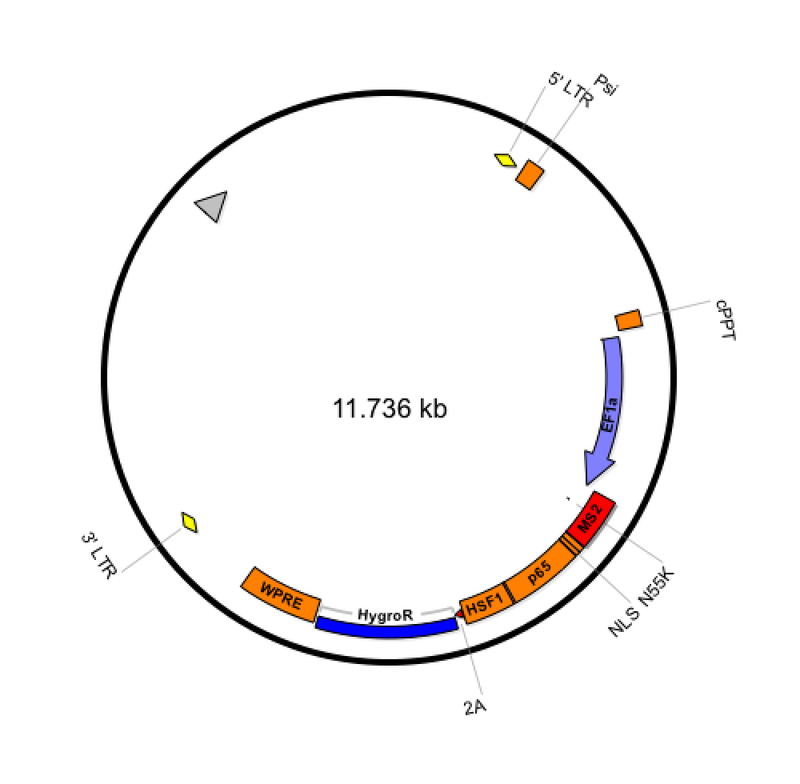 SAM libraries ordered prior to 4/3/2017 were shipped with this plasmid included. Ready-to-use Concentrated Lentiviral Prep particles produced from lenti MS2-P65-HSF1_Hygro (#61426). 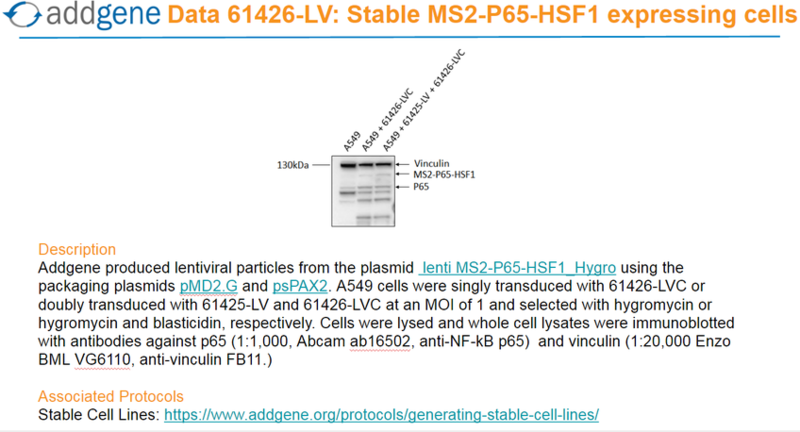 In addition to the viral particles, you will also receive purified lenti MS2-P65-HSF1_Hygro plasmid DNA. 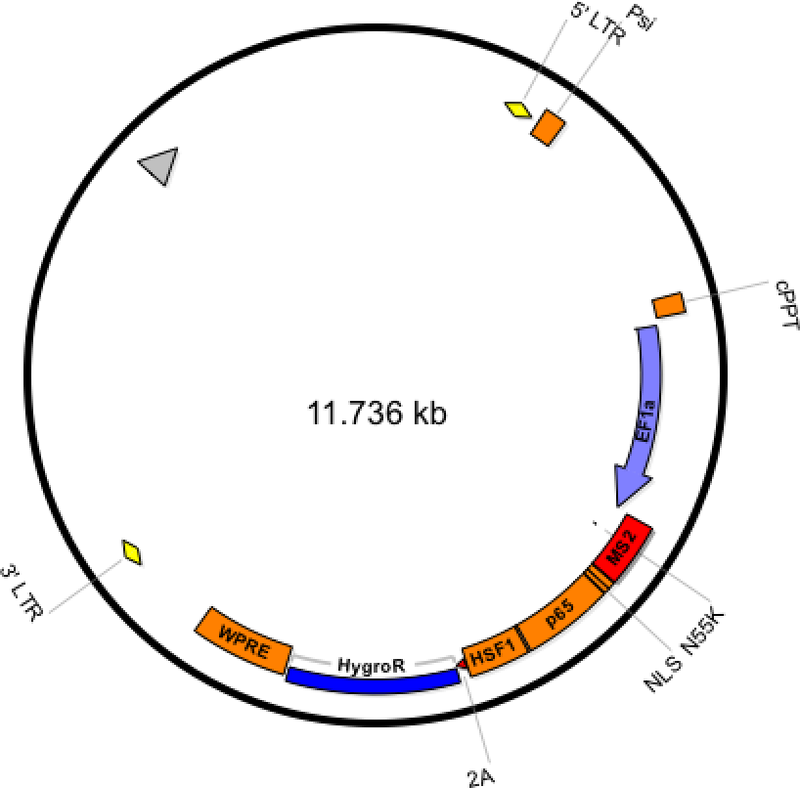 Concentrated lentiviral particles carrying MS2-P65-HSF1 and hygromycin resistance. 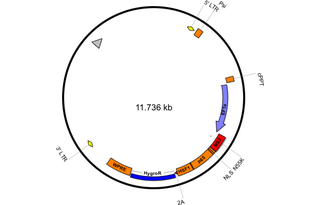 Pricing $150 USD for preparation of 50 µL virus + $30 USD for plasmid. Purification Lentivirus was harvested from cell culture medium (DMEM + 10% FBS). Lentiviral particles were then collected by precipitation in polyethylene glycol (PEG) followed by centrifugation. Precipitated pellets containing viral particles were resuspended in PBS. Proviral Integration Assay: Lenti-X 293T cells were serially transduced with 61426-LVC or a control virus of known titer. 72 hours after transduction cells were harvested, and gDNA extracted and assessed for integrated copies of WPRE. PCR confirmation of insert: PCR was carried out with primers targeting the hygromycin-resistance gene and pBluescript. The PCR product was visualized on an agarose gel for size confirmation. Confirmation of protein expression: A549 cells were singly transduced with 61426-LVC or doubly transduced with 61425-LV and 61426-LVC at an MOI of 1, and treated with hygromycin or hygromycin and blasticidin, respectively. Polyclonal pools of hygromycin-resistant or hygromycin and blasticidin-resistance cells were expanded, collected, lysed and tested for p65 expression via immunoblotting. 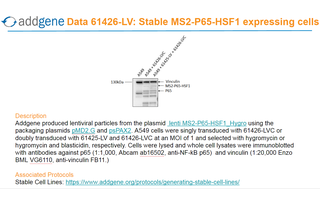 You can view the stable cell line expression data here or in the image section at the top of this page. Read our protocol for generating stable cell lines here. While the typical yield for lentiviral vectors ranges from 10⁶-10⁷ TU/mL, titers for large or toxic inserts, such as for MS2-P65-HSF1, can be 10-fold to 100-fold lower. Scientists generating their own lentiviral particles from MS2-P65-HSF1 should expect similarly low titers.